A Trial Advocacy Skills Training was recently conducted at the Tule River Tribal Justice Center and Osage Nation Congresswoman Shannon Edwards was the lead administrator and trainer. According to a prepared release, the three-day training took place in California March 5-7 with attorneys and advocates who practice in tribal courts from California to Michigan and Arizona to Washington. The participants worked with a mock fact pattern which included an alleged crime on the Tule River Indian Reservation, possession of opioids with intent to distribute, illegal dumping, and a child in need of care issues, said Judge Joseph Wiseman, the Tribe’s Chief Trial Judge. The Tule River Tribe of California is headquartered in Tule River, near Porterville, California. The training was made possible through a grant from the U.S. Department of the Interior, Bureau of Indian Affairs and Tribal Justice Support, according to the release. 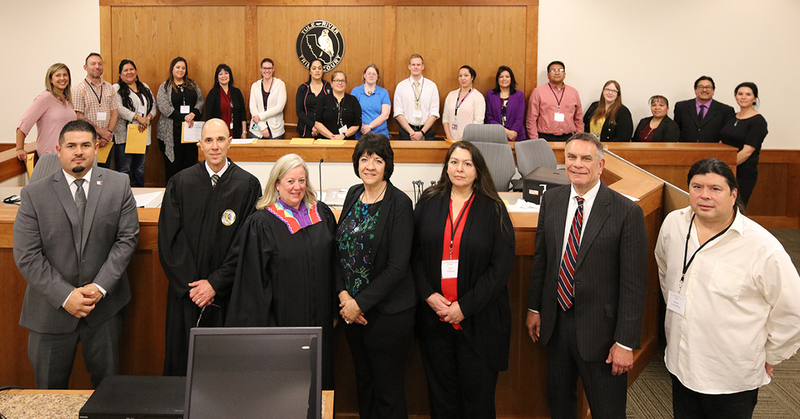 “It is our goal to provide tribal court practitioners with the same intense skills training made available to US Attorneys and Judges throughout the United States,” said Tricia Tingle, Tribal Justice Support associate director. Edwards is a graduate of the University of California, Berkeley and Georgetown University Law Center. She is a former law clerk to Hon. Luther Eubanks in the Western District of Oklahoma. She has worked as an attorney for the U.S. Department of Justice and established the Osage Nation Tribal Court as its first Supreme Court Judge in over 90 years. From 1995-2008 she was a partner in the Oklahoma City law firm Monnet, Hayes, Bullis, Thompson and Edwards. Since that time, she has maintained a solo practice and since 2006 has been a member of the Osage Nation Congress. Edwards has served on all the Congressional Committees and has chaired Budget and Finance, Appropriations, Commerce and Economic Development, Education and Rules and Ethics. Since 2010, Edwards has been an Appeals Magistrate for the U.S. Department of the Interior, Southern Plains Region. She is currently the Chief Magistrate of the Court. She also assists tribal courts throughout the Nation in assessing their processes and performance. She is a member of the American, Oklahoma and Osage County Bar Associations. She is also admitted to practice in the Northern, Eastern and Western Districts of Oklahoma and before the Tenth Circuit Court of Appeals and several tribal courts. Her areas of practice include trial and appellate practice, business litigation, Indian law, and insurance law.